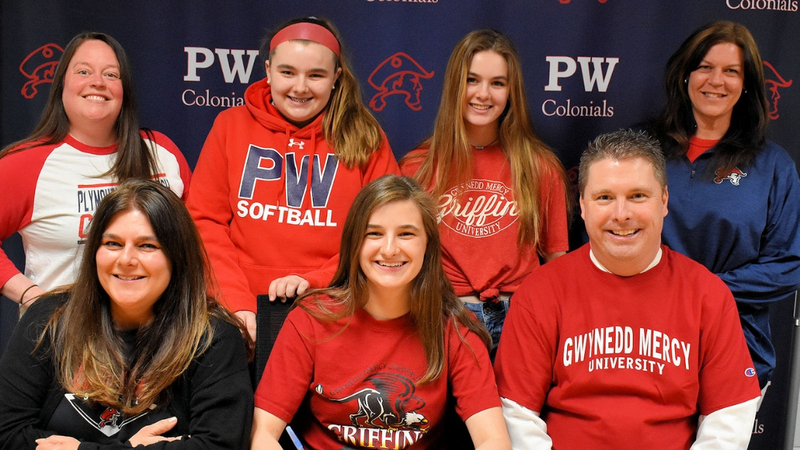 Plymouth Whitemarsh High School senior Emma Carney plans to play softball at Gwynedd Mercy University next year. A three-year varsity starter for the Colonials as an outfielder, Carney was named Second Team All-Suburban One League American Conference (SOLAC) last season. As a junior, Carney hit .319, including .368 with runners in scoring position, and has a .368 on-base percentage. Carney also had a .938 fielding percentage. She helped the Colonials to the 2018 SOLAC Softball Sportsmanship Award. Carney was named Honorable Mention All- SOLAC as a sophomore after batting .317 with a .347 on-base percentage. A Distinguished Honor Roll student, Carney participated in the PWHS Mini-THON. She plans to study nursing in college. Photo: Colonial School District – Seated (l to r): Stephanie Carney, Emma Carney and Kevin Carney. Standing (l to r): Assistant Coach Jen Hannold, Grace Carney, Molly Carney and Head Coach Dana Moyer.